AKASH INTERNATIONAL SCHOOL, is set amidst lush green surroundings at Devanahalli Town near Kempegowda International Airport. AIS campus is a marvel of modern architecture. The attractive landscaped estate boasts of beautiful structures, manicured lawns and waste & water disposal systems that make the campus eco-friendly. AIS offers its students all the advantage of a modern Educational system without the distraction of the modern city. The campus is in harmony with nature, surrounded by villages and a beautiful blue sky above. The idea of promoting an International school is to offer a complete education from childhood to adolescent and further leading to technological and modern Education. A hydro-pneumatically operated water system and noiseless power generators ensure uninterrupted water and power supply. High boundary walls reinforced at the top by electrified wire fencing make the campus safe and secure. CCTVs are positioned at all entrances and exists. Primarily to complement the non-invasive security system. A fire alarm and a fire fighting system add to their safety. Wi-fi system installed across the campus facilities the use of laptops and other equipment. Our unique and intimate learning environment, with smart classes, student teacher ratio of 1:20 with appropriate classroom training, enables students to learn in a collaborative ambience in a diverse educational community. Students’ progress is continuously monitored in scholastic and non-scholastic areas and a comprehensive report is posted online at the end of every milestone test and exam for parents’ reference. 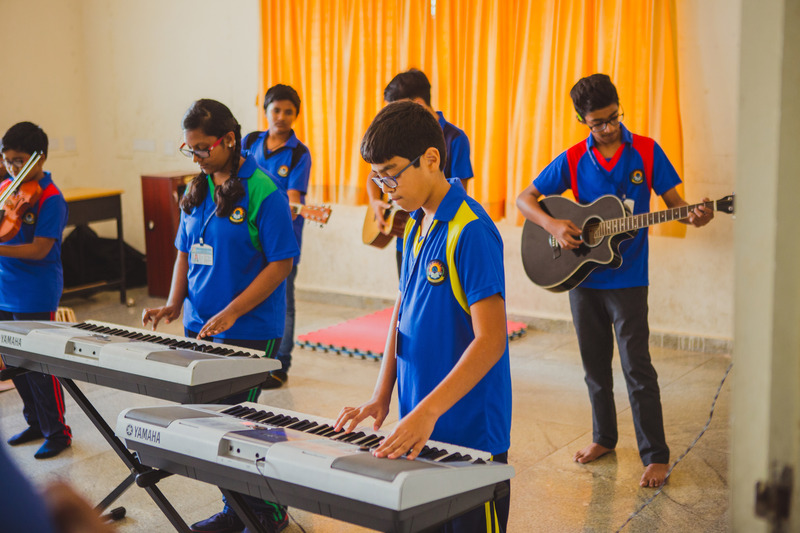 Particular emphasis is laid on music and dance, Indian classical & folk dance, western music & dance, instrumental music and singing are offered to students to develop their skills and musical appreciation. Each child takes part in at least one activity at the annual cultural event to develop their confidence on stage. AIS boasts of well-equipped art & craft rooms. Boys and girls enjoy hobby classes of toys and doll making, knitting, needle work, weaving, applique work, bread works, book binding, candle making, pottery, sculpture with wood and clay, various kinds of painting, embroidery, fashion designing, theatre, recycling of paper, cooking, baking, gardening etc. Opportunities for creative writing and taking part in debate, recitation and declamation, to improve rhetorical skills and eloquence in public speaking are provided. They are escorted to witness various cultural programmes and also represent the school in various co-curricular fixtures hosted by other schools. We like our students to be modern yet be proud of their heritage and imbibe a strong value system based on mutual respect for other culture and traditions. Thus we celebrate all festival with equal reverence and fervour. Every care is taken to provide joyous and festive moods to various celebrations like Raksha bandhan, Independence day, Ganesha Chathurthi, Onam, Krishna janmashtami, Ramzan, Teacher’s day, Children’s day, Christmas, New year and Pongal. Religion is not differential; it is a unifying cord, a reason for celebration. Along with being a great place to learn about educational research and strategies, workshops are a great place to meet other teachers with similar interests and make essential contacts that make teaching and learning easier. Workshops are also a great place to meet other educators who can help with situations more specific to teaching. AIS took opportunities to be a part of various educative and informative workshops for students and teachers.